You read that right, Chiang Kai-shek breath! The flight leaves China and arrives in Chicago at the very same time. It is an incredibly fast jet. The truth is it is a twelve hour flight from Beijing to Chicago, and there is a twelve hour time difference, and that’s how you take off and arrive at the exact same time! Two weeks ago, when Claudia and I flew to China, we lost a day. We took off on a Friday and arrived on a Sunday. And now as we go back home, we will gain a day, having two Saturdays. As a result of this, I will be suffering jet lag between now and Thanksgiving. I will probably sleep through the upcoming football season. The Crowds. China has 1.3 billion people, and I felt like everyone of them was in the streets during our visit. At any hour of the day, the streets in Beijing or Shanghai or other major cities in China are full of motorcycles, bicycles, rickshaws, cars, busses, and pedestrians. So help me everybody just pours into the streets with no regard for crosswalks or traffic lights. China resembles one massive demolition derby, but incredibly, the cars and motorcycles and bikes and people do not smash into each other. I did not witness a single wreck during my two weeks in China, but I witnessed hundreds of near-misses. In many, I was the miss-ee, which is a lot better than being the hit-tee. The Cranes. The entire Chinese nation is under construction. Shanghai makes Nashville look like Smyrna. We haven’t built a new skyscraper in Memphis in twenty years. I’m convinced that a new skyscraper has gone up in Beijing in the past twenty minutes. I believe the large gold star on the Chinese flag should be replaced by a golden crane. The incredible thing about all this construction is that just a generation ago, China was basically an agrarian society. It is now the most advanced urban nation on the planet. During my time in Beijing as well as my time in Shanghai, I often felt like I was a character in a Jetsons’ cartoon. I disagree. Chinese cuisine is fabulous and extremely healthy. Lots of vegetables and rice, but not Rice-A-Roni. Rice-A-Roni is the San Francisco treat, not the Shanghai treat. The People. An American tourist can’t travel alone or even with other Americans through China. You need guides, specifically Chinese guides. Everywhere we went in China, Claudia and I were accompanied by a guide. Without exception they were friendly, brilliant, and spoke English better than I do. My favorite guide was Michael. (All the Chinese guides have adopted English names.) 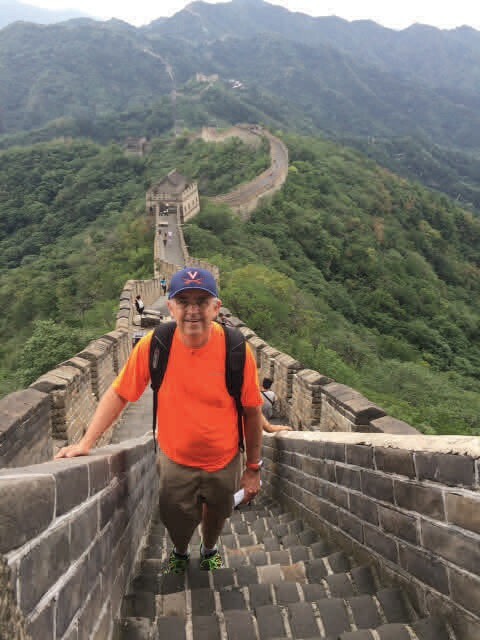 He was our guide in Beijing and took us through Tiananmen Square, the Forbidden City, and even to the Great Wall. Michael is married and has a seven year old daughter. He and his wife would like to have a car. They have applied for a lottery with the Chinese government in the hopes of winning one, or rather, winning the right to buy one. Michael said he had heard that many Americans have not just one car, but often two or more. I acknowledged that this was true. Michael then asked me how many cars Claudia and I own. I was too embarrassed to tell him the truth, although I did admit the driveway to our house resembles a used car dealership. Michael was valedictorian of his school in Beijing, the equivalent of an American high school. He then went on to University and because of his accomplishments he was invited to be a member of the Chinese Communist Party. Less than 10% of the Chinese people are members of the Communist Party. I also told him that if he were a capitalist rather than a Communist, he could own not one, but several cars. Michael did not get the joke. I laughed and said it was ironic that the first Communist I’ve ever met in my life turned out to be a big admirer of Richard Nixon. “I haven’t a clue,” I responded. I do not know the Mandarin word for “groan”, but it definitely applies here. On that note, I say, “Kaijian, China!” I’m headed home just in time for football season! best assignment writing service: Beautiful. The article is very interesting to read. I enjoyed it to the last word. 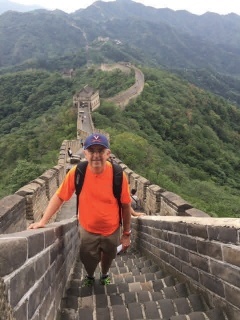 Bob: Did you find any Vol fans in China?